Above: Merna Kennedy and Charlie Chaplin in The Circus (1928). Merna Kennedy exploded on the movie scene as Charlie Chaplin’s hand-selected co-star in The Circus (1928). 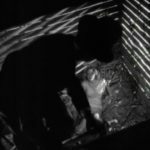 She transitioned from silent to sound film as the ingenue in Pál Fejös’s adaptation of Philip Dunning and George Abbott’s smash musical Broadway (1929), but from there she never caught on. An attractive little red-head with a lithe dancer’s body, Kennedy’s most recognizable attribute was her distinctive nose—a lengthy straight bridge with a bit of a droop at the tip that the cameras sometimes caught. The feature works on Merna Kennedy, allowing her to stand out among a crowd of actresses with otherwise similar attributes. Merna Kennedy appeared in over two dozen features before calling it a career in 1934, the year of her brief marriage to dance choreographer extraordinaire Busby Berkeley. She’d marry once more, but died just a few days after exchanging those vows. Merna Kennedy was just thirty-six years old. Or maybe thirty-five. To be completely honest, I’m not the guy who’s going to spend the ten bucks to confirm Kennedy’s date of birth*, but I’ll point you in the right direction just in case you feel the duty falls to you: THIS SAME PAGE will confirm that Merna was born Merna, and not Maude as the standard biographies have decided. She was born in Kankakee County, Illinois—as of the 1910 US Census the Kahlers still lived in Kankakee County, in the village of Bradley, town of Bourbonnais to be more exact. * Merna Kennedy’s date of birth is generally given as September 7, 1908; The link featured above is for a directory dated 1907-09; The California Death Index lists her date of birth as September 7, 1909. Indeed, you need look no further than the page linked above to see that it was Merna’s mother who was named Maude. Maude Myrtle Reed in full. The oft-married Miss Reed was born in Iowa to parents from Illinois, and it was back in Illinois where she’d marry Merna’s father, John Edward Kahler, a mason who later became a chiropractor and even an inventor of sorts, though Maude and children Merna and Melvin Merle “Bud” Kahler had moved on by then. Maude was just seventeen when she married the elder Kahler (1882-1957) in 1903, shortly after her strict Methodist parents had prevented Maude from attempting her own stage career. Maude Kahler turns up in California as early as 1913, though one newspaper account claims she and the children first spent a couple of years in Houston, Texas. I could not confirm that last fact through any of the Houston newspaper archives, but I don’t see why anyone would have made it up. Brother Bud, three or four years Merna’s senior, went to high school in San Bernardino, California, but Maude moved the family to Glendale while Merna was still in the sixth grade. Above: Merna Kennedy, age 9 or 10, clipped from the Los Angeles Evening Herald, December 19, 1917. The California Kahlers each took a new surname when Maude married produce man Thomas Grierson Kennedy in Los Angeles in June 1919. While I can’t say for sure when Maude split with Kennedy, by 1936 she was in the midst of ugly divorce proceedings with another man, Peter Gernert, described in newspaper reports as a “capitalist.” Whatever the specifics, it was the Kennedy name that stuck with both Kahler children. 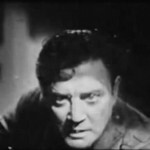 Merna was Merna Kennedy throughout her brief Hollywood career, and brother “Bud” identified himself as Melvin Merle Kennedy at the time of his marriage in 1936, the same year his mother was already splitting with third husband Gernert. I lost track of mother Maude after the split from Gernert, but it’s safe to say she outlived both children because Bud and Merna share a marker as son and daughter at their burial site in Inglewood, California. Bud died in April 1950. It was in dancing school in 1916 that Merna Kahler befriended Lillita MacMurray. 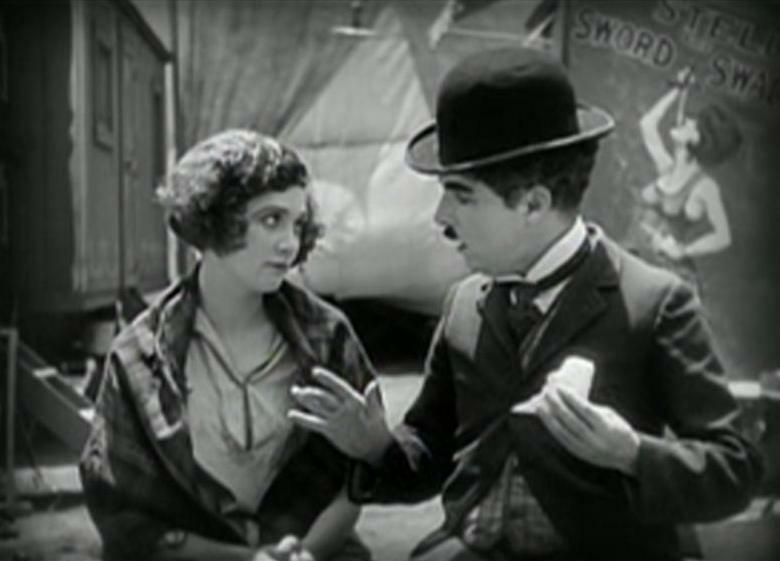 They remained friends throughout the time of Merna’s tours and Lillita’s first few appearances as an extra for Charlie Chaplin. The MacMurray girl had her pal, now Merna Kennedy, in tow when she went to see Chaplin at his studios in the meeting that led to Lillita’s casting in The Gold Rush—Merna comes off as reserved and even somewhat stupefied in her friend’s retelling of this event many decades later, but the meeting held more immediate importance for Lillita who was soon redubbed Lita Grey and then, soon after, Lita Grey Chaplin after she became pregnant by Chaplin, married him, and subsequently relinquished her part in The Gold Rush. Lita Grey’s is another story altogether, but what’s important insofar as Merna Kennedy goes is that Chaplin remembered the petite redheaded friend of the girl he married—stress on girl, Lita was sixteen when she and Chaplin married later in 1924. 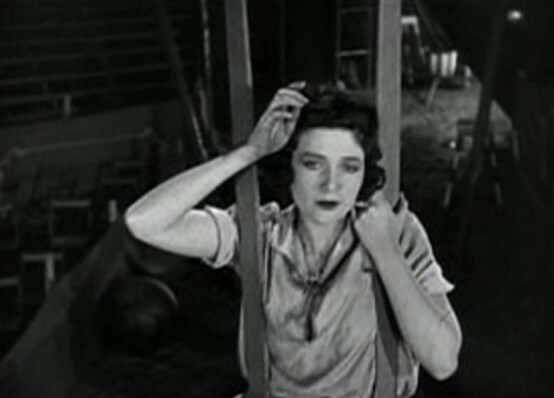 Above: Merna Kennedy in The Circus. Production on The Circus was cursed by interruptions and distractions including a fire that blazed through the studio and Chaplin’s divorce from Lita Grey, who listed Merna among a handful of well-known Hollywood actresses who she accused her husband of having an affair with. “I’ve known for a long time that you’ve been having affairs with different women,” Grey recalls saying to Chaplin in her more recent, 1998, memoir, “but having an affair with Merna is the last straw” (95). The gossip columns showed no mercy despite Merna’s insistence that she was already involved with actor James Hall by this time. (Variety linked Merna and Hall in their February 1, 1928 edition, the title of the article noting “James Hall’s Divorce Seems Bit Important”). 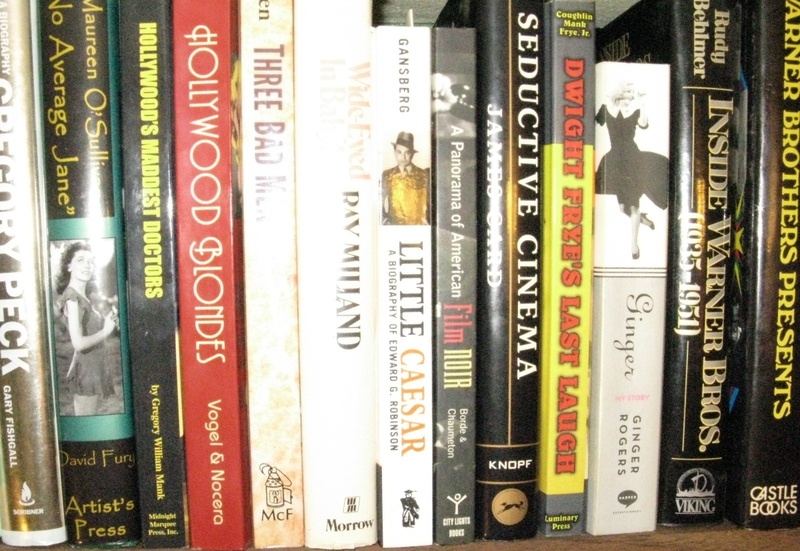 Chaplin’s reputation with women, especially young women, and Lita’s memoirs have all but turned suspicion into fact when it comes to an affair between Merna and Chaplin. 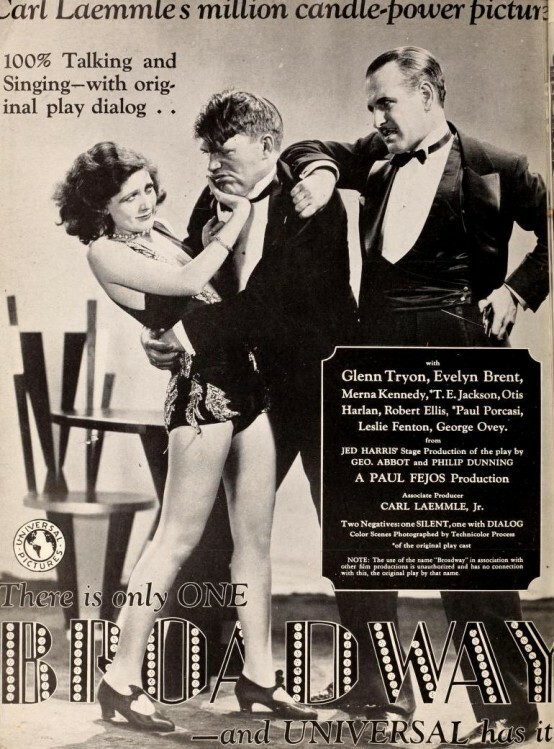 Above: Merna featured in April 1929 trade advertisement for Broadway. “I was discouraged just before I was signed for ‘Broadway,’” Merna told columnist Dan Thomas in April 1929. “I had been finished with ‘The Circus’ for nearly a year and hadn’t done a single thing. Of course, I was under contract to Charlie most of that time and was being paid. But I wanted to do something.” While Broadway wasn’t the smash it was on, ahem, Broadway, where it ran over 600 performances, it was a success, mostly because of innovative new equipment and director Fejös’s skillful technique. That said, Broadway didn’t do much for Merna Kennedy, who’s stuck in the thankless part of the sugary ingenue who the lead hoofer tries to win back from the nefarious gangster. For all of its pretty camera work, Broadway’s divide is a bit sharp for my tastes: the spectacularly filmed musical numbers more or less interrupt a static and overlong backstage mob story. Above: Merna with Glenn Tryon in Broadway. Still, Merna Kennedy’s second movie, Broadway, winds up as her second most important bit of movie work after her debut in the Chaplin film. Universal began teaming her with her Broadway leading man Glenn Tryon, and the two can also be seen together for a brief few moments in Merna’s third most impressive credit, King of Jazz (1930) with Paul Whiteman. Unfortunately, despite appearing in three separate skits within King of Jazz, Merna totals maybe two-to-three minutes of screen time. She appeared in three additional films opposite Tryon at Universal before moving on to the wasteland of indie leads and bit roles for the majors. Above: Merna at the right with Laura La Plante in King of Jazz. 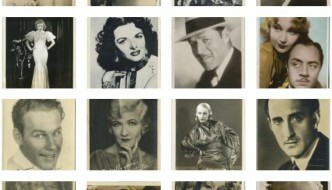 More than two-thirds of Merna’s entire film output—that is, her final 19 movies—were released between 1931-33. There was good reason for her to be so busy: in 1931 she had voluntarily filed for bankruptcy listing her liabilities at just under five thousand dollars and her assets as none. 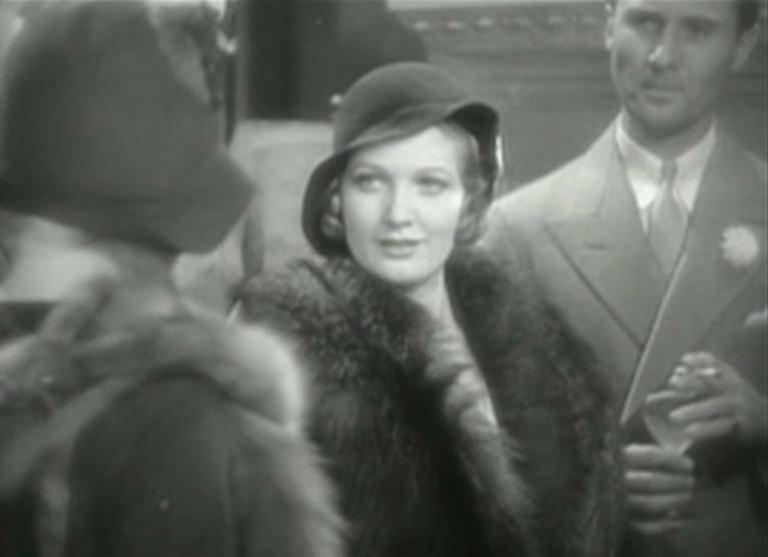 Above: Merna Kennedy in Lady With a Past. 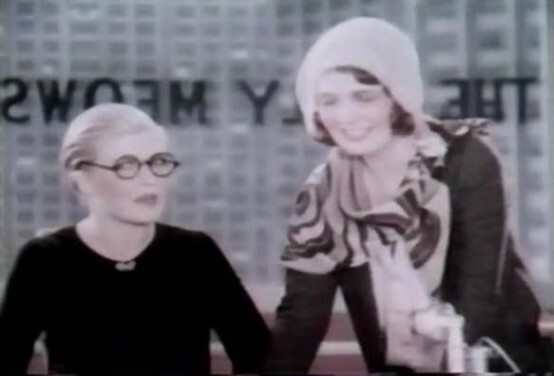 Her small supporting role in the Constance Bennett vehicle Lady With a Past (1932) is a fun one that helps spur the leading lady into manufacturing her own past: Merna is Ann Duryea, a social butterfly whose popularity is entirely based upon her having been acquitted for having killed her husband. Merna’s at the other end of a similar situation as Pat O’Brien’s cheating wife in Laughter in Hell (1933), a title high on my want list, though for reasons other than Merna Kennedy. 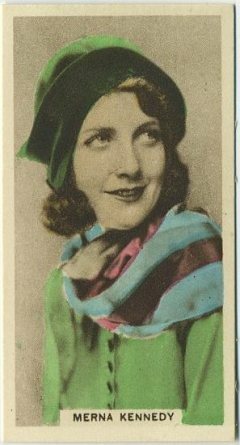 Two enjoyable Merna Kennedy appearances in more substantial parts include her turn opposite cowboy Tom Keene in RKO western Ghost Valley (1932), and a starring role for indie outfit Tower Productions as an unsuspecting moll for hire in Red-Haired Alibi (also 1932), the film that actually inspired this post. Her career wound down in billed bits at Warner Bros. where she’s one of a few girls from town showing interest in Joe E. Brown in Son of a Sailor (1933); alongside Fifi D’Orsay as the quieter half of a gold-digging tandem who’ve set their sights on Guy Kibbee and Hugh Herbert in Wonder Bar (1934); as Jitters, a wisecracking secretary for James Cagney even before he tries to get manners in Jimmy the Gent (also 1934). 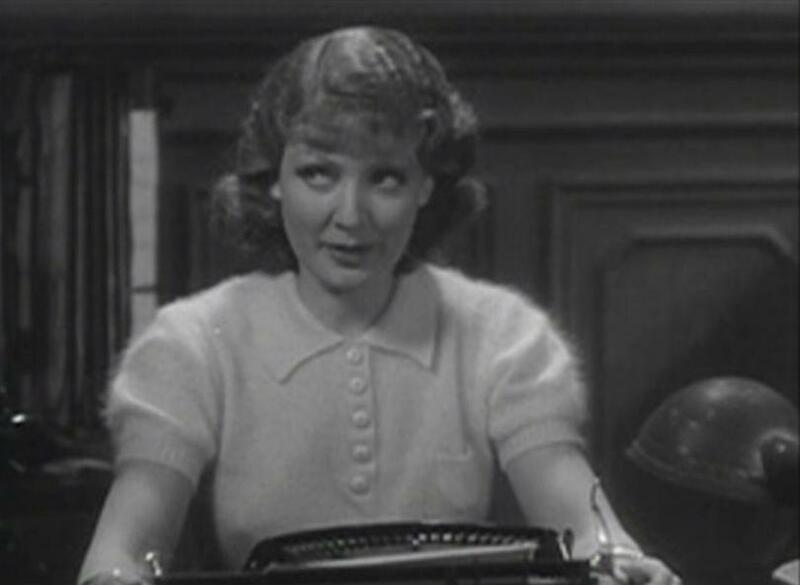 Above: Merna Kennedy in Jimmy the Gent. Merna and dance choreographer Busby Berkeley were already engaged by the time they worked on Wonder Bar, and they were married before the movie even reached theaters. Studio executive Jack Warner was one of the witnesses to Merna’s marriage to Berkeley on February 10, 1934. The union was short lived. “He just quarreled with me all the time and wouldn’t take me out,” Merna said in divorce court. “Anything I did caused him to quarrel with me,” she said of Berkeley, whose “nagging habits” were so persistent that Merna claimed she had to undergo hospital treatment for her frayed nerves. She was seeking $3,000 a month from Berkeley, but the court awarded her a total settlement of just $7,500 to be paid to her at $100 per week. Merna was also allowed $2,500 to cover attorney’s fees and supposedly awarded “several parcels of real estate” and an automobile. 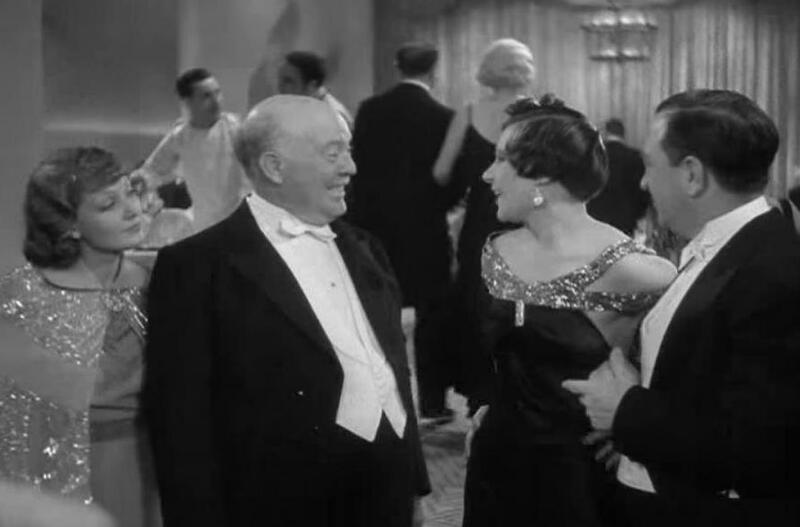 Above, left to right: Merna Kennedy, Guy Kibbee, Fifi D'Orsay, and Hugh Herbert in Wonder Bar. 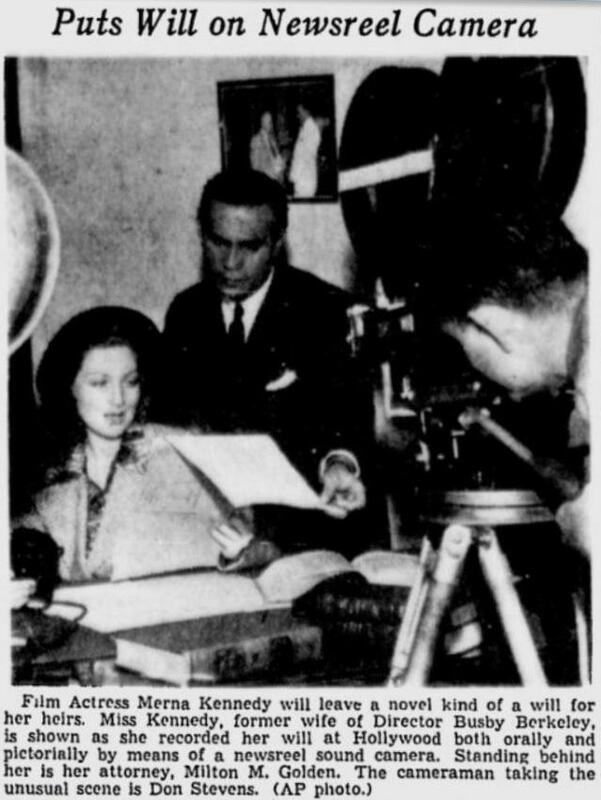 Merna was done with the movies, though did make one more highly publicized film appearance in which she read her last will and testament before cameras. The story was syndicated with photos of Merna alongside her attorney, who informed the press that his client was leaving one-tenth of her estate to charity and dividing the remainder between her mother and her brother. It’s unlikely anyone would have suspected that Merna Kennedy’s will would have to be read so soon. 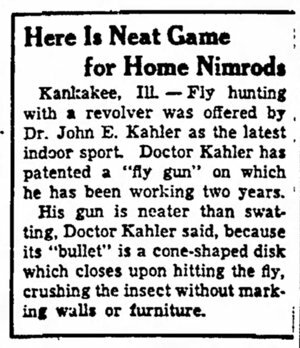 Above: Clipped from the Spokesman Review, 19 May 1938. Merna Kennedy died of a heart ailment at age thirty-five (or thirty-six) on December 20, 1944. Only four days prior to her death Kennedy married Sgt. Forrest Brayton. She had waited three years for Brayton to return from military duty in the South Pacific. The same gentleman was a witness to her brother Bud’s wedding in 1936, so even if their marriage was tragically short, Merna and Forrest Brayton at least knew of one another for several years. There is very little suspicion or speculation upon Merna Kennedy’s tragically early death beyond one source: her friend Lita Grey Chaplin’s disavowed first memoir. In that book, published 1966, Chaplin wrote, “Red-haired Merna Kennedy was dead at thirty-five from what the papers had called a heart attack.” The italics are mine, as the phrasing gave me pause. Merna’s own mention of her “frayed nerves” during her divorce from Berkeley also made the hairs on my neck stand, but then they’d say anything to get a divorce in those days. Whatever the case, Merna Kennedy died way too soon. Had she lived longer chances are her film career would have remained complete as it is now. There were rumors that she was wanted for a small part in a William K. Howard film in 1939, but that information didn’t do much to stir anybody up. Instead, she will forever be remembered for her convincing performance as the innocent and abused performer who Chaplin falls for in The Circus, and the place she may or may not have had in Chaplin’s personal life during the time that film was made. Newspaper reports of Merna Kennedy’s funeral note that Chaplin did send flowers. “Actress Reads Testament Into Sound Film to Be Shown After Her Death.” San Bernardino County Sun. 6 May 1938, 23. “Answers to Movie Fans.” Lincoln Star. 11 Oct 1931, D-7. Chaplin, Lita Grey and Morton Cooper. My Life With Chaplin: An Intimate Memoir. Battleboro, VT: Bernard Geis, 1966. Chaplin, Lita Grey and Jeffrey Vance. Wife of the Life of the Party: A Memoir. Lanham, MD: Scarecrow, 1998. “Dancing Party.” Los Angeles Evening Herald. 22 May 1913, 18. “Funeral Services Held For Merna Kennedy.” San Bernardino County Sun. 24 Dec 1944, 1. Hein, Erwin S. “Local Girl Is Leading Lady for Chaplin.” San Bernardino Daily Sun. 3 March 1926, 1. “James Hall’s Divorce Seems Bit Important.” Variety. 1 February 1928, 9. “Merna Kennedy Broke.” Harrisburg Telegraph. 15 Aug 1931, 3. “Merna Kennedy Granted L.A. Divorce From Hollywood Dance Director.” San Bernardino County Sun. 29 October 1936, 5. “One-Time Protege of Charlie Chaplin Dies.” Decatur Review. 21 December 1944, 9. Price, Guy. “Diversified Bill at the Pantages.” Los Angeles Herald. 15 May 1918, 16. Spivak, Jeffrey. Buzz: The Life and Art of Busby Berkeley. Lexington: University Press of Kentucky, 2011. “Star’s Mother Seeks Divorce.” San Bernardino Daily Sun. 10 Apr 1936, 9. “Theater Reviews: Pantage.” Los Angeles Herald. 18 December 1917, 24. “‘The Remaking of a Nation’ Is Attraction at the Casino Theater.” San Francisco Chronicle. 24 Apr 1918, 4. Thomas, Dan. “Merna Kennedy WIns and Hollywood Gossips Lose.” St. Petersburg Independent. 22 April 1929, 4. 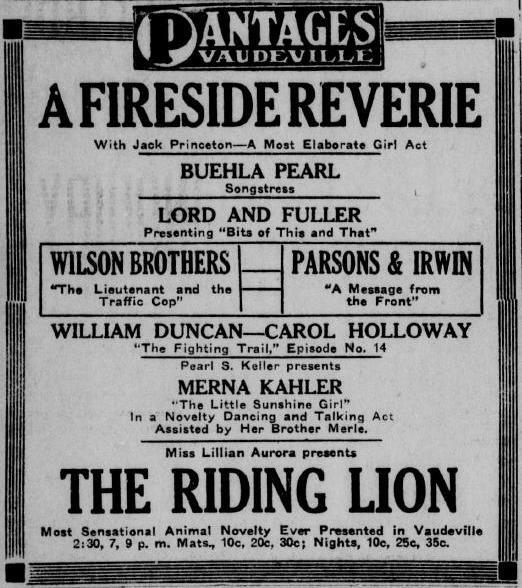 Above: Merna Kahler featured in Los Angeles Evening Herald advertisement, 17 December 1917. 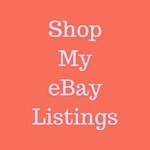 In addition to any linked within the body of the article. “California, County Marriages, 1850-1952,” database with images, FamilySearch (https://familysearch.org/ark:/61903/1:1:K8J6-HHC : accessed 27 March 2016), Busby Berkeley Enos and Merna Kennedy, 10 Feb 1934; citing Los Angeles, California, United States, county courthouses, California; FHL microfilm 2,075,115. “California, County Marriages, 1850-1952,” database with images, FamilySearch (https://familysearch.org/ark:/61903/1:1:K8FF-GXR : accessed 20 March 2016), Melvin Kahler Kennedy and Jeanne Blair Purpus, 12 Jun 1936; citing Orange, California, United States, county courthouses, California; FHL microfilm 2,051,138. “California, County Marriages, 1850-1952,” database with images, FamilySearch (https://familysearch.org/ark:/61903/1:1:XLHR-CJ3 : accessed 20 March 2016), Thomas Grierson Kennedy and Maude Reed Kahler, 28 Jun 1919; citing Los Angeles, California, United States, county courthouses, California; FHL microfilm 1,033,288. “California Death Index, 1940-1997,” database, FamilySearch (https://familysearch.org/ark:/61903/1:1:VP7W-N6F : accessed 20 March 2016), Melvin Merle Kennedy, 02 Apr 1950; Department of Public Health Services, Sacramento. “California Death Index, 1940-1997,” database, FamilySearch (https://familysearch.org/ark:/61903/1:1:VPQC-B4M : accessed 23 March 2016), Merna Brayton, 20 Dec 1944; Department of Public Health Services, Sacramento. “Illinois, County Marriages, 1810-1934,” database, FamilySearch (https://familysearch.org/ark:/61903/1:1:QK9L-1JZ5 : accessed 25 March 2016), John Edward Kahler and Maude Myrtle Reed, 19 Sep 1903; citing Kankakee, Illinois, United States, county offices, Illinois; FHL microfilm 1,839,994. “United States Census, 1910,” database with images, FamilySearch (https://familysearch.org/ark:/61903/1:1:MKDP-FNC : accessed 25 March 2016), Mima Kahles in household of John Kahles, Bourbonnais, Kankakee, Illinois, United States; citing enumeration district (ED) ED 95, sheet 6A, NARA microfilm publication T624 (Washington, D.C.: National Archives and Records Administration, n.d.); FHL microfilm 1,374,311. “United States Census, 1920,” database with images, FamilySearch (https://familysearch.org/ark:/61903/1:1:MHQJ-DZT : accessed 20 March 2016), Anna Kennedy in household of Thomas Kennedy, Los Angeles Assembly District 63, Los Angeles, California, United States; citing sheet 3A, NARA microfilm publication T625 (Washington D.C.: National Archives and Records Administration, n.d.); FHL microfilm 1,820,107. Above: Merna with Joe E. Brown in Son of a Sailor. 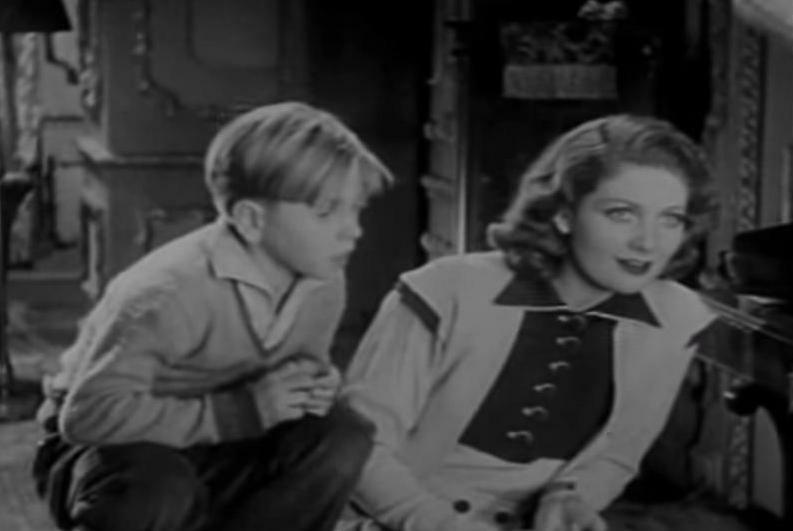 Above: Merna with Mickey Rooney as her little brother in The Big Chance (1933). Above: Merna in The Rampant Age (1930). Above: The world meets Merna Kennedy in The Circus. Thanks for an interesting post about a gal I always wanted to know more about. Good read! Thanks, Marsha, glad you enjoyed it! I decided to include RED-HAIRED ALIBI in my second pre-Code eBook, so I really wanted to get to know her better myself.